I fear I sound like a broken record, but I am off again in a few hours on a flight at an ungodly hour tomorrow morning. This time, I'll be on location in Jamaica where I'm sure my sweat will be sweating. And since it's pretty much against my religion to check a bag, the only way I get through some of these kinds of trips is to bring detergent and hand-wash my clothing as I go. Even if I have enough clothing for the days I'm on a trip, I never want them to be sitting in my sweat for too long (gross, I know). 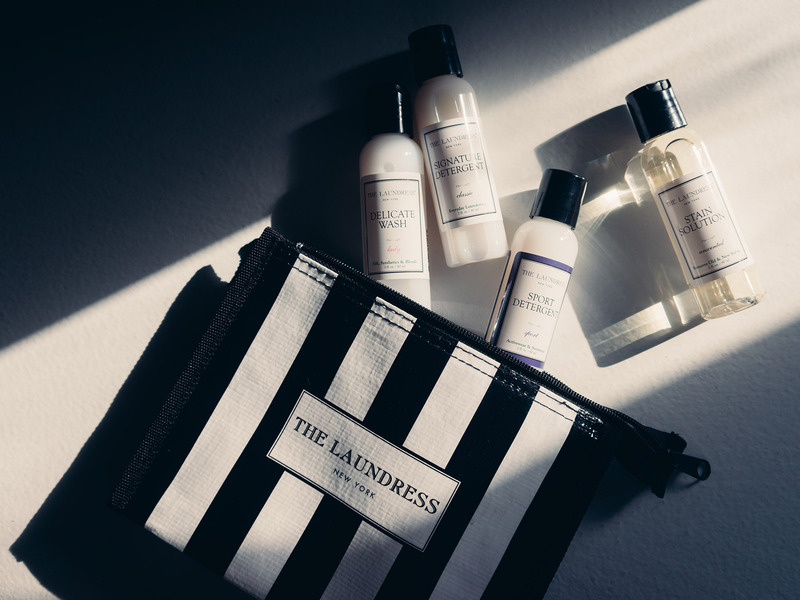 I've long been a fan of The Laundress products and I don't know why it took me so long to pick up their travel kit (got mine on Amazon). Oh I am a big fan of their products too. My silks have been very happy since. I believe they are environment friendly too. I wish they made a bigger size. I seem to be going through a lot of them and ordering them online has become a hassle. so smart! that's always a huge struggle of mine while i'm traveling as well! gorgeous photo and such a great idea! I never thought to do this. Probably could've done this last week when I was on vacation. Very cute bag they come in too! Haha, my order of The Laundress products arrived just 2 days ago! Have been using them for a while and love them, great idea bringing them on travels though! Love the Stain Solution!